If you have been at Albright anytime in the last seven decades, you probably know Professor J. Dale “Doc” Yoder ’57. You may know him as a fellow classmate and alumnus. You may have been on the basketball or baseball team with him. You may remember him as a gold-painted Adonis holding a torch on the 1956 Homecoming float. From 1966 on, you probably took one of his history courses and remember him as a teacher who actually made history something to love. If you played tennis during those decades, you were lucky enough to have him as a coach. And you certainly know Doc Yoder as a mentor, an adviser, a willing ear, a colleague and a friend. You may also know that he became a member of the Alumni Association Board after his retirement in 2006. 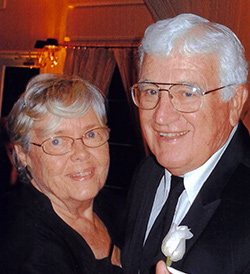 Dale continues to give of himself to his beloved Albright, and is still, along with his wife, Nicole Donnay Yoder ’59, a faithful donor to the College. Today, he remains active, dividing his time between Florida and Pennsylvania – and continues playing tennis! He makes everybody around him better. He always says it’s not what you get. It’s what you give. “No matter what generation of students or what time in history, each has felt the loving hand of alma mater…The academic excellence of Albright, mixed with the College’s special sampling of love and caring unites all Albrightians. I know how much Albright has meant to me.” – Professor Yoder, Albright’s Sesquicentennial Celebration. We invite you to make a gift to The Fund for Albright in Dale Yoder’s honor. Your gift will be a recognition of his lasting impact on the College and a chance to let Professor Yoder know just how much he has meant to Albright – and to you.